You can tell your friends and family they should be shooting videos horizontally all you want, but that won't stop them from capturing unwieldily vertical clips that are impossible to fullscreen on a computer. But there's finally a solution to this problem. Simply hide their default camera app—bury it deep in a folder somewhere—and replace it with Horizon, a replacement camera app that captures horizontal videos no matter how the device is held. 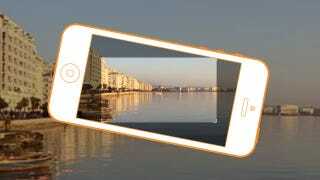 Available for most newer iOS devices with a camera that can capture video, the app relies on your phone or tablet's built-in gyroscope to automatically keep a scene framed in a perfectly level 16:9 aspect ratio, even while it's being rotated.